The ZickZack skin features the amazing work of Michael Schmid check out his amazing work on his website! We use the power WordPress 3.x has to offer! Show of products or a website portfolio with incredible portfolios. Three, Two and One Columns supported. 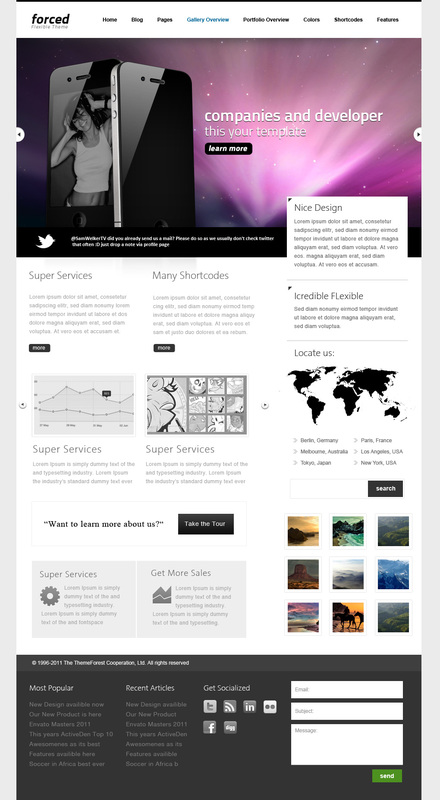 Not only for the overview page, but for each portfolio category. Its as simple (or even simpler) as creating a blog post. All from the backend. No coding required! Its as easy as inserting an URL! When installing the delivered Plugins, you get the power of about 30 video host pages! or host the videos by yourself! We deliver custom widgets that make it possible for you to create your own page! Create as many custom sidebars as you want! All through the backend menu – no coding required. We created a variety of incredible useful widgets for you to choose from. 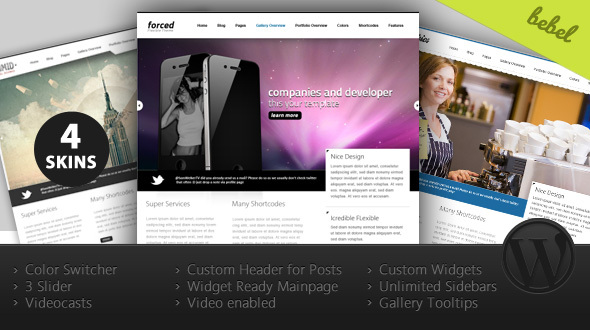 Take a look at the preview to see what Force has to offer! The widgets are waiting for you in the widget area of the wordpress backend. What is better than a moving picture when it comes to learn something? We created some quick videocasts to show you how to setup and get started with Force. The new BebelCp2 is the most powerful backend of our production. It is *fully PHP5 OOP* based, you can extend our classes to adjust the settings to your needs. If you have a knowledge of php5, you will love this! requires PHP5! If you are still running on php4, tell your host to update immediately. PHP4 does not provide any security update since 3 years!